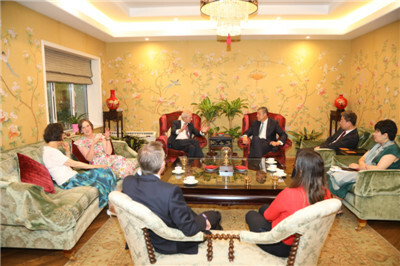 On July 25, China’s Ambassador Liu Xiaoming and Madame Hu Pinghua invited the Rt. Hon. 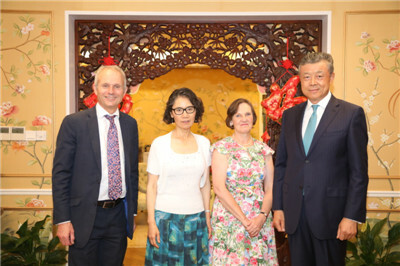 David Lidington CBE MP, Chancellor of the Duchy of Lancaster and Minister for the Cabinet Office, and Mrs. Lidington to his official residence, and exchanged views with him on China-UK relations. 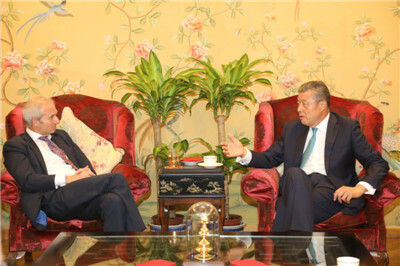 James Wild, Lidington’s Special Adviser, and Minister Ma Hui of the Chinese Embassy were present. Ambassador Liu congratulated Lidington on his leading the UK delegation to the 10th China-UK Leadership Forum last April. He noted that President Xi Jinping and Prime Minister May sent congratulatory letters to the Forum respectively, underscoring the great importance that the leaders of the two countries attach to developing China-UK relations. This year, China-UK “Golden Era” has been accelerating with a good momentum in high-level exchanges and fruitful results in the cooperation on the Belt and Road Initiative, and in economic and trade and financial fields, and people-to-people and cultural exchanges. Both China and Britain are firmly opposed to protectionism and supportive of free trade. Bilateral communications on global issues, such as climate change have been close. These have enhanced the strategic, practical, global and inclusive features of China-UK relationship. The Ambassador hoped that the two countries will continue to work together to make the China-UK “Golden Era” strong and enduring. Minister Lidington was delighted to recall his participation at the Forum in Beijing, saying that he had in-depth exchanges with the Chinese side on China-UK relations and other major issues. The Forum was a complete success and enhanced China-UK political trust and friendly cooperation. China has made extraordinary achievements in its reform and opening up over the past 40 years, and its recently announced major measures on expanding opening up are of positive significance. Britain is committed to promoting China-UK “Golden Era” and stands ready to work with China closely to strengthen the cooperation on the Belt and Road Initiative so as to produce more “golden fruits” for the “Golden Era”.